Since the course began in 2013, industry professionals, graduate students, postdocs, science educators, and junior faculty have completed our immersive two-week laboratory class. The Course will focus on how the complexity of biological systems, combined with traditional engineering approaches, results in the emergence of new design principles for synthetic biology. Students will work in teams to learn the practical and theoretical underpinnings of cutting edge research in the area of Synthetic Biology. In addition, students will gain a broad overview of current applications of synthetic biology by interacting with a panel of internationally-recognized speakers from academia and industry during seminars, lab work, social activities. In order to be considered for an award, you must specifically reference which one you are eligible for in the Stipend Request section of your application. The Synthetic and Systems Biology Summer School (SSBSS) is a full-immersion five-day residential summer school on cutting-edge advances in systems and synthetic biology with lectures delivered by world-renowned experts. The 2018 Summer School will take place July 25-29, 2018 at Certosa di Pontignano in Tuscany, Italy. Understanding the multi-level nature and feedbacks involved in biological development requires an integrated, systems biology approach. This practical course will provide students with the theoretical background and the hands-on tools that are needed to enter this rapidly growing area of science. The methods and techniques taught in this practical course are essential for unravelling the complexities that come from interactions between different levels of biological organisation and the non linearity of the biological processes. This practical course is aimed at experimental biologists with an interest to understand and explore how the complexity of biological systems can be dealt with within a mathematical or computational framework, *and* at computationally and mathematically oriented students interested in learning leading-edge computational techniques that can be applied to gain insights in developmental biology. Please register online at https://www.conference-service.com/pc17-47/welcome.cgi stating your motivation for applying and brief research interests. Applications will be limited to 24 students and successful applicants will be selected from the described motivation and research interests. Accommodation and full board will be provided. *Application Deadline:* April 07, 2017. These day-long workshops will introduce challenges and opportunities in the field of cell-free diagnostics, with talks from the OpenDiagnostics team, expert in the latest advances of this technology Keith Pardee (University of Toronto, Canada) and plant disease expert Dr Richard Echodu (Gulu University, Uganda). This will be followed by an interactive sandpit session, and lab practicals the following day. There will be a day long practical session taking place at the University of Cambridge department of Veterinary Medicine on the 17th of March. Details for the venue to come. Image credit: Jun Seita via Flickr, licensed under CC BY-NC 2.0. Do you want to raise your profile? Experience presenting to a multidisciplinary audience? Find ideas and inspiration? Find out how it really looks like to work in industry? CambPlants is organising THE event to go to if you are thinking of what’s the next step in your career. FOR WHOM: Early career scientists (PhDs & Postdocs) working in plants, synthetic biology, big data, agricultural, environmental, food and other relevant sciences contributing to our food supply. This weekend, the first EUSynBioS Symposium, themed Engineering Biology for a Better Future, will follow SynBioBeta at Imperial College London. The Symposium kicks off with a Visionary keynote address from none other than synthetic biology pioneer Tom Knight (Ginkgo Bioworks). A former professor at MIT and one of the very first synthetic biology entrepreneurs, Tom will give an insight into the early days of synthetic biology and talk about what the future holds. Then, a session of scientific presentations exclusively by early career synbio researchers; providing graduate students and early career post-docs a platform to present their research to peers and senior scientists. Post-lunch, the symposium will break into smaller breakout sessions on various topics from biodiversity to design and public engagement. Led by excellent fellow members, these sessions are a great opportunity to hear other people's views on important issues in synbio today. Two inspiring speakers - Luke Alphey (Oxitec) and Emily LeProust (Twist BioSciences) - will then talk about their career paths to setting up world changing synbio companies. 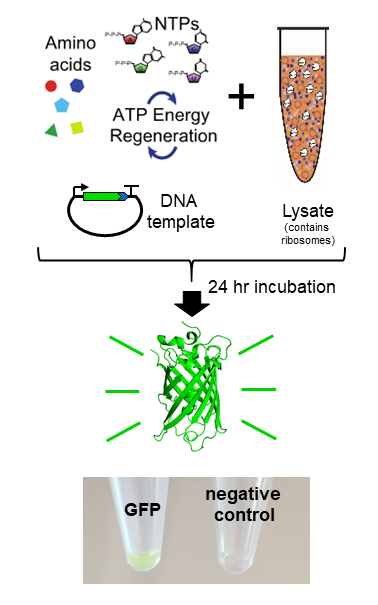 A must for all budding synbio entrepreneurs! Michele Garfinkel (former Policy Analyst at the J.Craig Venter Institute, and currently at EMBO) will talk next, on the world of policy making and how we can make a difference in how synbio is legislated in the future. Finally, the symposium will close with an Open Discussion on a topic chosen by you: Gene Drives! Gene Drives have gotten a lot of press in the last few months and we have none other than the scientist who coined the term, Austin Burt (Imperial College London), joined by Michele Garfinkel and Luke Alphey, giving an introduction to what this fascinating technology holds for the future. This session is a forum to express views and get answers from experts about gene drives: How do they work? Will they change the world for the better? Is it ethical to do so? ...and many more questions, we’re sure! The Software Sustainability Institute is a national facility funded by the EPSRC. Since 2010, the Institute's Research Software Group has assisted over 50 projects across all the UK Research Councils. In an ongoing survey, 93% of our previous collaborators indicated they were "very satisfied" with the results of the work. To see how we've helped others, you can check out our portfolio of past and current projects. We’re also interested in partnering on proposals. If you would like to know more about the Open Call, or explore options for partnership, please get in touch with us at info@software.ac.uk. With support from the University of Cambridge SynBio Fund, CUTEC is hosting the UK’s first ever bio-focused “hackathon” in the University of Cambridge. Interdisciplinary teams will take on some of the greatest challenges facing biology. A resource is defined as a source or supply from which a benefit/need can be obtained in order to function effectively. The UN has estimated that in 15 years we will need 30% more water, 45% more energy, and 50% more food than today. The percent of arable land in the world is estimated to be 13.31% with only 4.71% sustaining permanent crops. However, by rethinking what counts as a “resource” people are finding clever ways to produce food in inhospitable environments, for example one experiment in the desert of Qatar takes advantage of abundant sunlight and seawater to turn out 75 kg of vegetables per square meter. How can we adapt to less than ideal environments to continue to live comfortably while supporting a planet of over 7 billion humans? We will place scientists, engineers, business students, social scientists, and artists on teams to solve one of three challenges: (1) Compost, (2) Soil structure, and (3) Seed distribution. Solutions will need to take into account and will be judged on efficiency, sustainability, and economy. Teams will workshop their ideas with industry experts at four workshops over the course of eight weeks and then present their solutions on stage at the TVC in front of investors, academics, students, and incubators. Studies show that compost use in arable rotations can improve yields and resilience. Tons of organic, compostable material is thrown out in cities every day. How can we create an economical way to sort and get organic waste from cities to farms? The physical structure of soil affects crop development and yields. Detailed soil structure tests can be performed in labs, but this is time consuming and costly. Can we make better in-the-field tool(s) to let allow farmers to check soil structure and resilience? Cover-cropping is a great way to rehabilitate soil and can provide wide ranging benefits in farming systems. The most success often comes with mixing multiple species; however, these species have seeds of different sizes and shapes which makes it difficult to spread them evenly using current technology. Can we create a way to make it practical for farmers to sow seeds of different sizes? 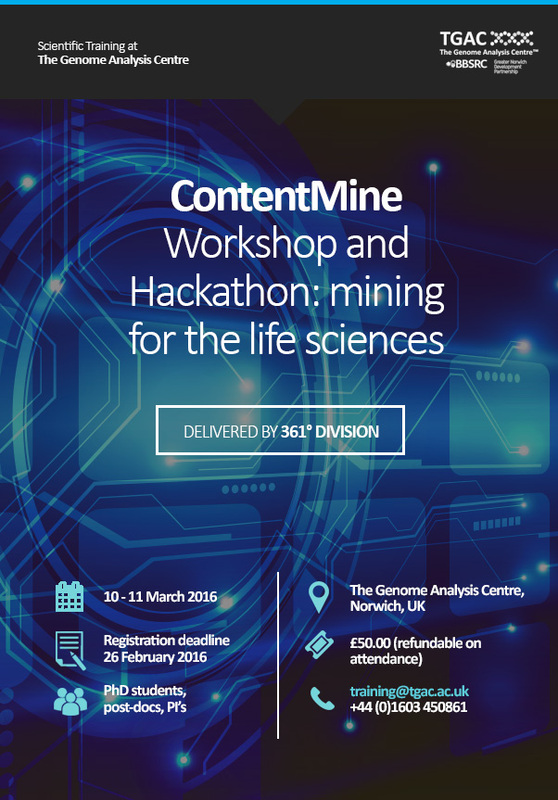 Interested in using mining technologies for synthetic biology? Content mining technologies hold much potential for maximising scientific discovery and the reuse of research through automated searching, indexing and analysing of scientific literature. In this workshop, we aim to educate and engage technologists and biologists who are interested in using mining technologies for synthetic biology; to better enable access to research literature and data in plant synthetic biology. The hackathon on Day Two aims to improve searching and indexing of plant synthetic biology texts through open source technology platforms developed by the Grassroots Genomics project at TGAC and the ContentMine platform from the University of Cambridge. Best suited to biologists and bioinformaticians who have some experience of using command line tools or the enthusiasm to pick this up! As such, formal programming experience is not a requirement, but you may find it useful to attend the Software Carpentry Bootcamp held at TGAC prior to this event. Course prerequisites: Basic prior knowledge of programming concepts. The registration fee is £50.00 (plus booking fee of 2.13 per cent) – refundable on attendance (minus booking fee) which will be processed post event. We are also able to reimburse up to two nights accommodation with a limit of £80.00 per night (receipts required). From the UK KTN Synthetic Biology SIG As part of SynbiCITE’s drive to commercialise synthetic biology through taking R&D excellence in the lab to the development of tools, products, processes and services for high value manufacturing industries, they have developed a ‘4-day More Business Acumen (MBA)’ course to help develop the natural entrepreneurship that is so keenly demonstrated across their wide range of partners.